Her newest work that is a series of large bowls which Ruth enjoys making on her potters wheel in her Long Island studio or her Studio in Jewett, New York. The brighter interior reds and purples contrasted with the colorful exteriors will enhance all of the tables of the Catskill for their summer menus. Ruth adds incised decor, decals, and underglazes as well as scraffito to the outsides and some interiors of her bowls. “I enjoy making pottery that is functional and useful for everyday occasions. It is made to be touched and used by all,” says Ruth. The summer season brings on adventures in the form of cooking, some of which include wonderful recipes for salads and pastas. A big salad or pasta bowl is just right for summer barbecues and outdoor lunches and dinners. Ruth is a potter who loves to cook, so she even shared her recipe for summer salad! Toss all ingredients together in a large ceramic handmade bowl , drizzle with olive oil and serve, correct spices as you like. Ruth also makes jewelry with a ceramic theme . One of her latest creations (pictured left) will be in the silent auction at the Catskill Mountain Foundation Annual Benefit! Stop by the Kaaterskill fine Arts & Crafts Gallery to pick up the perfect bowl today! The gallery is open Friday, Saturday & Monday 10 am-4 pm; Sunday 10 am-3 pm. From the Ukraine to the US, everyone seems to be in agreement that Ilona Sochynsky is a great painter. With an extensive career involving both countries – from a commissioned mural in Atlantic City, to the State Museum of Lviv in Ukraine – Sochynsky has quite a bit of experience in the art world. Read on to see what she had to say about the evolution of her career, her hobbies, and what has influenced her along the way. You’ve certainly been in the art world for a while; your career spans more than two decades. How has your art changed over time? Over the 20-year span that you reference, my artwork has progressed from hyperrealism to abstraction. Influenced by Pop Art of the late 70’s and early 80’s I used my own photographs as source materials to create paintings. Very soon I started to split the images into large fragments, recombining the sections and thereby creating a new painting. This deconstruction process continued over the years and resulted in compositions (often kaleidoscopic) where the fragments were no longer recognizable. college level. Do those two mediums ever intersect? I studied and worked as a graphic designer before resuming and dedicating myself to painting. Both professions deal with visual communication and the formal elements of art and design such as composition, form, color, texture space, etc. The graphic designer’s goal is to please the client. As a painter I have only myself to please, unless the artwork is a commissioned one, such as the large mural I painted in Atlantic City. When you’re working for such a busy organization with a million things going on all at once (hey, that sounds like the Catskill Mountain Foundation. Hint hint. ), sometimes things fall by the wayside – they get lost, put at the bottom of the to-do list, buried under a pile of papers on your desk – but sometimes those things truly deserve to see the light of day…and while I’d love to print out this interview and leave it on the sunny sidewalk to catch some rays, I think the CMF blog will have to do for now. Anyway. This show was partially a result of you working for the Foundation, correct? How did you get involved with CMF? Yeah, I would say it’s safe to assume. I worked for CMF as the Programming Assistant. I found out about the job through a great friend, Cara, who used to work there. I went over and had dinner with her and her amazing family one night, and the next day I had an interview and a job! It was great! I worked closely with Pam Weisberg and Carolyn Bennett. Carolyn had mentioned that she wanted me to have a show. I ended up leaving CMF but kept in touch with Carolyn and we set a date for the exhibit. The rest is history. There’s a party at the Kaaterskill Fine Arts & Crafts Gallery! Actually, there’s an exhibition called A Celebration of Community by painter Alix Hallman Travis, who recently had a talk with Carolyn. Read on, fellow party-goer! And just to be clear – Carolyn did this interview, but Maggie insists on being credited for the delightful pun in the title. 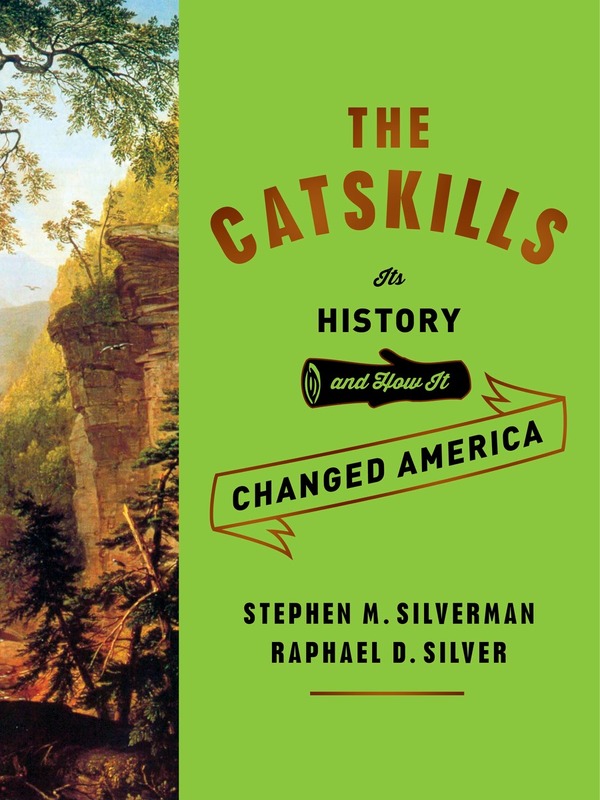 I’ll start with the proverbial “tell us a little bit about yourself” – when did you first come to the Catskills and why? In 2003 while residents of Cleveland, OH my husband and I purchased a house in the Mid Catskills area of Margaretville in Delaware County to be nearer family that had a home here. We were attracted to the area because of its beauty and I particularly because of the comfortable ease with which I could paint outdoors in the landscape. I had just finished my study at the Cleveland Institute of Art and was an active plein air painter. While I knew almost no one here I felt safe in stopping by the side of the road and setting up my easel—painting alone is not always possible in a large urban area like Cleveland. You have a very interesting style, reminiscent in some ways—especially in your use of vibrant color—of the Bahaus Movement of the early 20th century. Can you comment on that? don’t even mention putting my signature in the space provided on a credit card receipt! 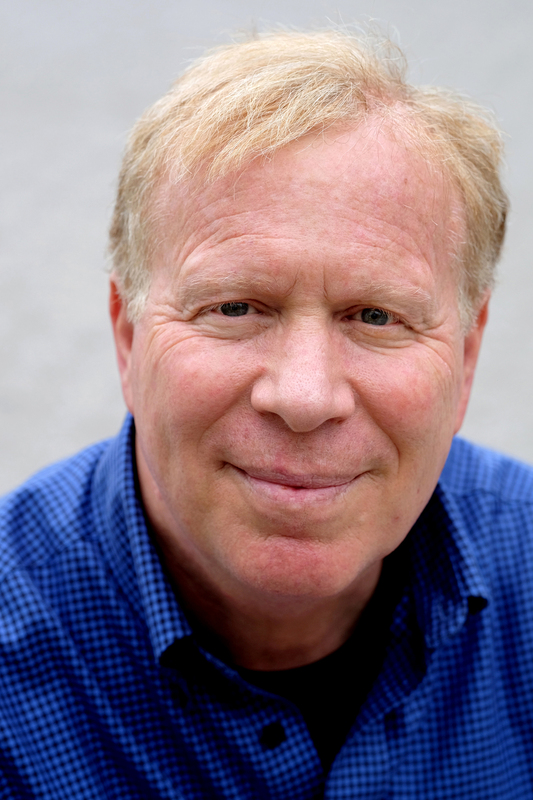 The Catskill Mountain Foundation has never experienced a shortage of incredible people to talk to, and my latest incredible conversation was with Alexis P. Suter. We talked about her career in music, and how it may have been a career caring for animals instead. Luckily for us, she decided that owning a cat was enough to satisfy her love of pets. How did you go from singing house and dance music to blues and rock? Vicki Bell and I were in the studio one day, and discovered that we both had awesome ideas and a creative appetite to do more than dance music, and we wanted to explore other avenues. So blues was a perfect match for me and my vocal style, while having a background in Gospel made it really easy to jump right in feeling like we belong there. What was it like opening for people like BB King and Etta James? Opening for legends like BB King and Etta James was mind blowing to say the very least. I opened for BB 6 or 7 times – each time was amazing. Moments like that keep me humble; knowing so many others could have been chosen, but us Brooklyn kids got to do it, that’s amazing. Do you think it’s important for music to be part of people’s lives? Music should be mandatory in people’s lives because it has healing agents in every note, every melody, and every chord….it’s the one thing in life that is designed by emotion. What advice can you give to young musicians? To those that want a serious career in music, prepare yourself for anything! There are many up’s and down’s, but if you are happy and passionate about your craft, then do what you love. And while you are at it, GET AN EDUCATION!!! This business is not for the thin skinned, and for that reason alone, have something to fall back on and leave the rest to us warriors. Did you always want to be a musician? I never wanted to be anything else but a musician, except maybe a veterinarian because I love animals. I figured I’d own a cat and sing, so it sorta worked out. What’s your favorite song to sing, and why? I love “Oh Holy Night,” this song really moves my soul. Singing it brings great peace to me, and my love of Christmas, because it is about Grace, family, and love. My favorite place in the world is home with my beautiful family, who I love with my life. The joy I feel when I am with them lifts me with love, and nothing in the world can compare to that, nothing. Music means total freedom to me. No boundaries, no shame, total expression of self, vulnerability, nakedness, truth, pain, joy, happiness, love, acceptance!!! Experience the talent that is the Alexis P. Suter Band on February 13th at 8PM in the Orpheum Film & Performing Arts Center, where they will be joined by the Ray Blue Organ Trio. For tickets or more information, call 518-263-2063 or go to catskillmtn.org. Why are you called Professor Louie? Rock & Roll Hall of Famer, Bassist and Vocalist, Rick Danko of The Band gave me that name…my middle name is Louis. I was producing, playing, and engineering for The Band, and he felt it was an appropriate name. I have always been extremely honored by that. It seems that piano players always get a moniker of some sort. What is your favorite instrument to play, and why? I consider the voice an instrument and enjoy singing and playing with it. I can communicate to the audience one on one. Don’t like to talk about myself. Have you played with any of the musicians on the bill for Common Ground on the Mountain before? Describe this concert in six words. World class musicians in one concert. Common Ground on the Mountain will be held at the Orpheum Film & Performing Arts Center on January 16th at 8PM, and will feature Walt Michael & Company, Tony Trischka, Professor Louie & the Crowmatix, and Greg Dayton. Tickets can be purchased at our ticketing website or by calling our ticket line at 518-263-2063. This is a concert you don’t want to miss! Somehow I was lucky enough to catch the attention of Julie Fowlis, the perpetually busy musician! Constantly busy with touring and kids, she’s not easy to track down – but it was definitely worth it. Keep reading for her thoughts on family, traditions, and more. I have been performing at some level or other since I was very small I suppose. I would sing or play at ‘cèilidhs’ (small, informal gatherings) when I was very young, and was performing on a professional, albeit a part-time basis, by the time I was in my late teens. What made you choose the Scottish Gaelic tradition? It’s what is in me! It wasn’t a conscious decision, it’s just what I felt most drawn to. Are there different variations of Gaelic, like there are different dialects in spanish? Yes. Within Scotland we have regional dialects, but we also have very close connections to Irish and Manx, which all stem from the same language. They are different enough now to be considered different languages, but they are really one and the same. It’s been said that you might be the first Scottish Gaelic crossover ever; how does that feel? Is this what you imagined when you started performing? You did a cover of Blackbird by the Beatles but in Gaelic, which I thought was really cool. I think the best part about that is that so many people know the words, so even doing it in another language, people understood exactly what you were doing. What inspired you to do that, and would you do something like it again? We were invited to re-record that song for an album produced by London music magazine MOJO which was a celebration of 40 years of the Beatles White album. It was interesting, challenging and fun to work on, and we loved it so much we still sing it now. It has become part of our repertoire – alongside songs from 18th century Scotland and pipe tunes. Have you seen the movie Brave? Who’s your favorite character? How does travelling around the world to perform affect your family dynamic? In other words, how do you make it work? It’s a constant juggling act! But my husband and I have it pretty much down to a fine art now. Packing, unpacking, entertaining children on tour, finding good places to play, explore and eat on the road. I am lucky that the children enjoy travelling, find the touring an adventure and simply want to be with us, so as long as they are happy – I am happy. What got you into doing radio shows? I was invited to host some of my own shows here on the BBC in Scotland. This has led to many things over the years, and I have presented for many companies and channels, including across BBC Radio and TV stations in Scotland, England, TG4 in Ireland and SKY. It’s good to work on other things other than performing music, and I enjoy the challenge. You seem to be incredibly invested in your native traditions. Why do you think it’s important to preserve those traditions? They make us who we are. I really believe that. They contribute so much to our sense of self and sense of place. In terms of the language there is an oft used phrase ‘tìr gun teanga, tìr gun anam’ which means ‘a land without a language is a land without a soul’. The same applies to the music. Traditional language and music connect people and communities, and more importantly connects them with their landscape in a very meaningful and positive way. On October 10th you’ll be performing at the Doctorow Center for the Arts in Hunter, NY. Did you know that’s only about half an hour away from East Durham, the Emerald Isle of the Catskills? I had heard about it! We are very excited to visit. 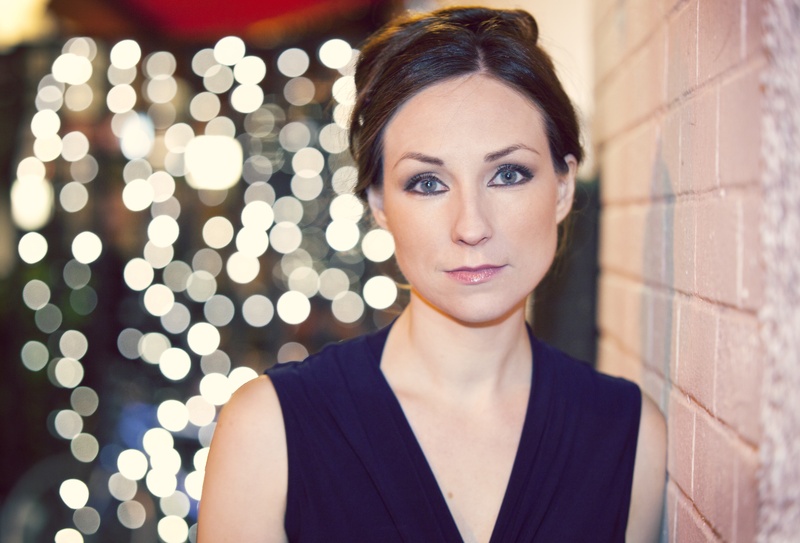 Julie Fowlis will be performing in the Doctorow Center for the Arts on Saturday, October 10th at 8PM. Reserve your seats by calling 518-263-2063 or visit our ticketing website…this is a show you won’t want to miss. I can now check interview a Reiki Healer off of my bucket list, because Susan Hintz-Epstein is more than just a mask maker! I had the great opportunity to learn about her part in the Kaaterskill Fine Arts & Crafts Gallery’s latest American Masquerade exhibition, as well as Reiki and multiple Native cultures. There are a LOT of artists that are involved in American Masquerade if you look at all of the events from the Mainly Greene cooperative, so there are a lot of different interpretations of the theme. You took a very literal approach to it; can you tell me about that? I started much rougher than these masks that you see in the show. I wanted to make something that expressed the spirit, or essence, of the animal as also would have been seen through the eyes or awareness of ancient peoples who lived with the animals. I was very moved at the beginning by the book Black Elk Speaks. Black Elk was a Lakota who was born prior to Custer’s Last Stand and lived in the old way, close to the land while there were still buffalo to hunt. A person of that time worked very closely with the animals whose help assured his survival. Animals partnered the people. A mask could help one take on the characteristics of the animals one lived with or wanted to hunt. I wanted to see what that felt like. 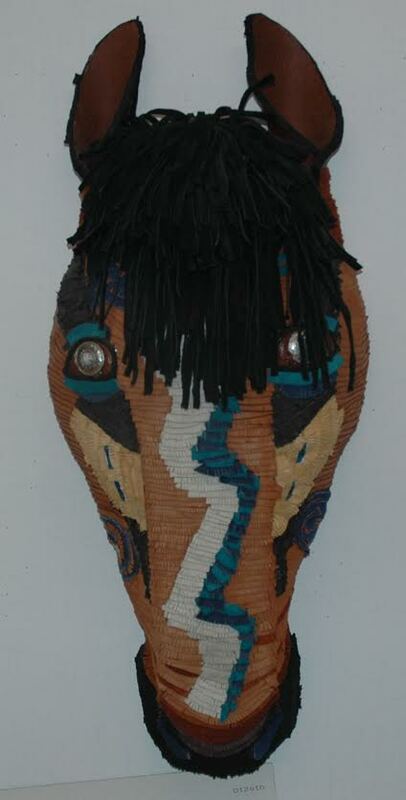 Your masks look very detailed – hand cut leather, painted eyes – how long did it take to make each one? If I had nothing else to do, a mask like these could take me three to six weeks working all day. Patience was necessary because of the drying time for the paper mache. If you have taken one off the wall to look, you will see how very thick I have worked the foundation for the sculpture. What got you interested in Native cultures, as well as shamanic practices? When I was still a child, I felt something missing from life in the way I was being raised, and later I realized that was a close involvement with Nature. I idealized the old ways of the Native Americans because they had lived close to Nature. In my late twenties, psychic gifts began to awaken for me, and these included awareness of the energies of the plants and animals around me. At that time I was a farmer’s wife, and I had ample opportunity to work with animals and keep a garden. I read a lot: Carlos Castenada and Black Elk, and I studied Gurdjieff with Ann Kelly and Don Petacchi. The Gurdjieff work is a path toward conscious being. In the 1980’s and 1990’s I did not find available shamans to work with, but in 2004 doors began to open for me and I met people who directed me to the next stage of learning. I studied Reiki, I became initiated as a Mesa Carrier, and now I work with the Runes in a shamanic practice that is based upon a reconstruction of the ancient Norse traditions. What Native culture(s) do you find most interesting? The Lakota are the most interesting, as they were among the last tribes to be conquered and thus have a more complete access to their oldest traditions. The true medicine people among them teach to walk the Earth in a humble way. Explain to me what it is to be a shaman in this day and age. It is like practicing a job no one knows about. It is an inner knowing that holds awareness of the spirits of Nature that are around one, it is like being a diplomat between the spirit world and the world of human beings. Part of the job includes being a “psychopomp,” one who crosses the dead over to the world of spirit. A shaman can interact between people and the world of spirits. We have freed places from dark entities. A shaman may also be a healer and/or a holy person who can work with energies and prayer to make life better for others, to bring balance back to what is out of balance. To be a shaman is to be a Spirit-worker. You can be a shaman and a healer, but just because you are a healer does not make you a shaman. Some of the eyes of your masks in American Masquerade are “found objects.” What’s the craziest or weirdest place you’ve found something to use in your art? I once made a rearing horse sculpture using wire I took down from an electric fence. The horses had been playing, and a mare I had reared up and the wire expressed my impression for the sculpture. As for eyes, I love beads. My best ones came from a bead store that used to be in Woodstock, but I think they went out of business. Sometimes I find really neat old jewelry in thrift shops that I take apart and play with. Every season holds it’s own mood and beauty. I tend to prefer the changes of spring and fall because I am fascinated by the energies of things coming into being and things passing away. Both are a time of change and color. Spring brings back color from the gray cold of winter and autumn brings us vivid hues of changing leaves and the browning down of things from green. But winter allows me to test my levels of strength, endurance, and patience. All seasons are good. Susan will be giving an art talk in the Kaaterskill Gallery on Saturday, October 3, from 1 to 3PM. 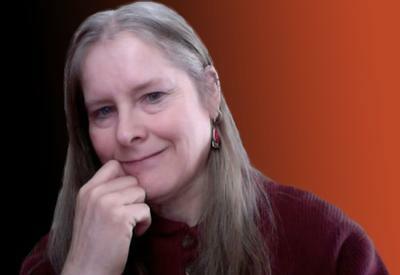 Don’t forget to check in with CMF on Facebook – Susan has been kind enough to show me some of what she does as a shaman, and the video is coming soon!